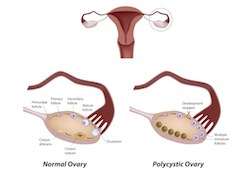 Polycystic Ovarian Syndrome (PCOS) is often associated with impaired fertility. Patients may suffer from reduced or absent ovulation, irregular menstrual cycles and difficulty conceiving as a result. Researchers from Carolinas Medical Center and Penn State University College of Medicine recently published a review of the condition and the impact on fertility in Current Opinion in Endocrinology, Diabetes and Obesity. The review focused on PCOS management in terms of fertility and reproductive health. According to researchers, metformin treatment support is dwindling with a concurrent rise in support for clomiphene citrate treatment for improved ovulation. The use of clomiphene citrate to improve fertility in patients with PCOS is currently part of the trial Pregnancy in PCOS. The trial is currently in stage 2, which will evaluate the safety of clomiphene citrate treatment versus letrozole treatment. Researchers note that overweight and obese women are advised to lose weight as part of the initial PCOS treatment for infertility. Losing weight helps balance menstrual cycle and reduce the need for further treatment. If ovulation is impaired by PCOS, clomiphene citrate can be used as the initial therapy, thought weight loss is still suggested to reduce pregnancy and birth complications associated with weight. Metformin, used in some patients with PCOS, does not provide fertility support or reduce the risk of miscarriage. If clomiphene citrate is used, education on the possibility of multiples conception needs to be tackled before treatment begins. Source: Usadi RS, Legro RS. Reproductive impact of polycystic ovary syndrome. Curr Opin Endocrinol Diabetes Obes. 2012 Oct 25.